The XENON1T detector sits in the center of a large water tank. All the signal and high voltage cables for the photosensors in the time projection chamber are guided by a pipe that goes from outside where the computers are located—through the tank to the detector. 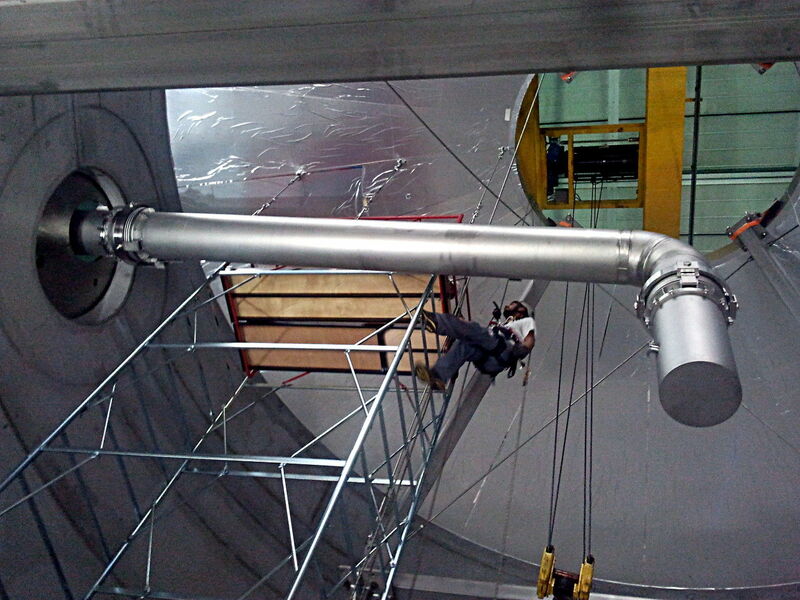 This stainless steel pipe was produced by ALCA, a company located near Vicenza in Italy. More than 900 cables, each 10 meter long, had to be inserted into a 10 centimeter diameter pipe. 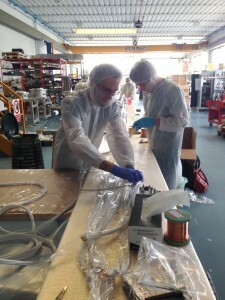 Before the installation the cables were prepared at the University of Zurich. We developed two types of connector made out of PTFE and copper; one for the high voltage cables, one for the signal cables. These connectors satisfy the stringent requirement on radioactive cleanliness. Each holds 24 cables into one bunch. These connectors were mounted on both sides such that they can be easily connected to the detector itself inside the water tank and to other cables, leading to the electronics outside of the water tank. 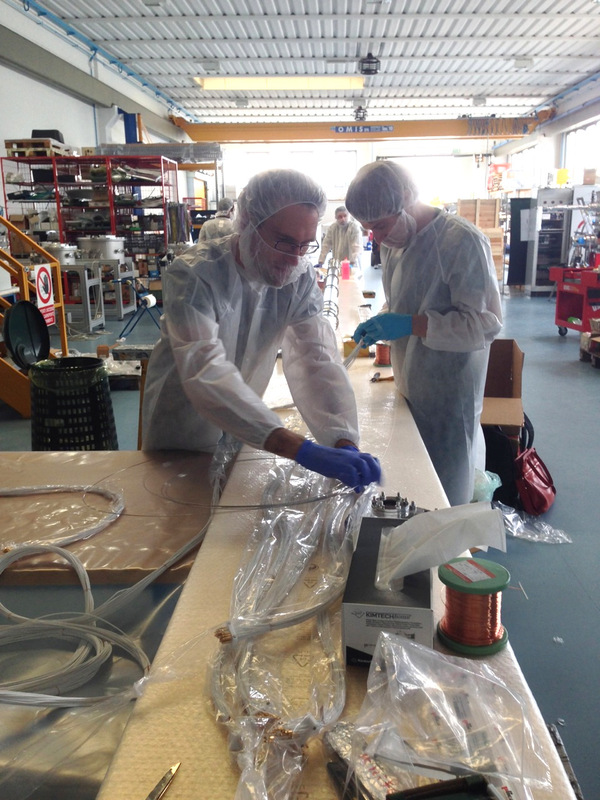 After bunching the cables they had to be cleaned and packed carefully to protect them from pollution during the transportation to ALCA. At ALCA, each bunch was unpacked and one after the other inserted into the pipe for which we fixed each to a steal pulling wire. After all bunches were successfully inserted, both ends of the pipe were closed with caps, because the pipe had to be pumped in order to remove substances like water or alcohol that remained in the cable bunches from the cleaning process. 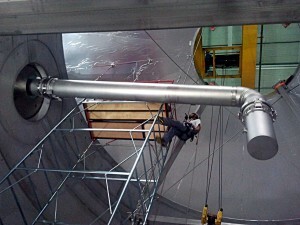 Installation of the signal cables under clean conditions. This entry was posted in Experiment and tagged 2014, cables, construction, water tank, XENON1T on August 22, 2014 by Gaudenz Kessler. The XENON1T detector sits in the center of a large water tank. All the signal and high voltage cables, pipes for liquid and gaseous xenon, vacuum piping and various other lines get there via one large pipe. These are the signal wires, bunched together into a single pipe inside the cryogenic pipe. 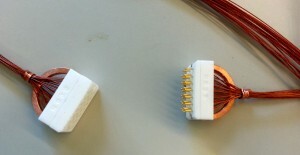 They are PTFE-insulated, low-radioactivity wires with custom-made connectors. 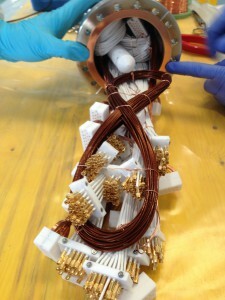 This entry was posted in Experiment and tagged 2014, cables, construction, water tank, XENON1T on July 25, 2014 by Rafael Lang.